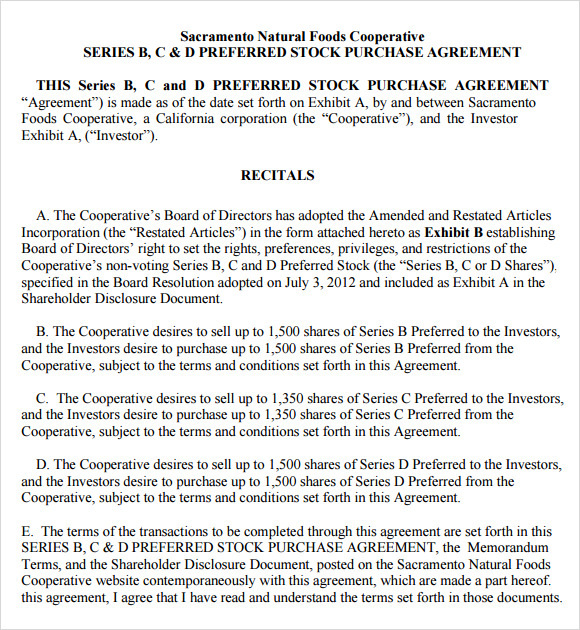 A stock purchase agreement is a must while buying or selling of shares. 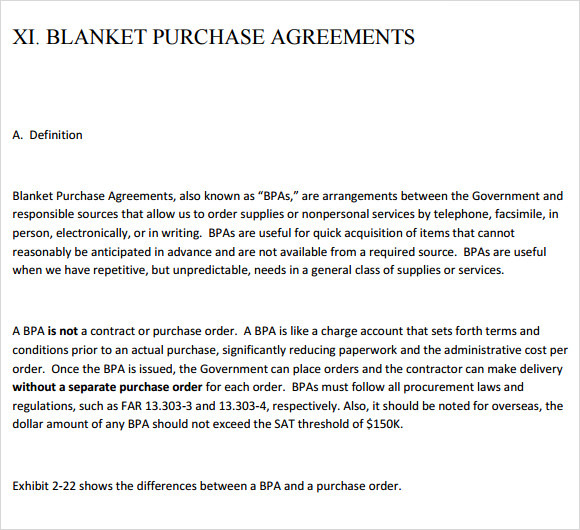 This document specifies all the terms and conditions related to the sale. We have a wide range of collection of Stock Purchase Agreement Templates that can save you from a lot of trouble finding the proper format and including all intrinsic details that are required for the legal procedures. Download our premium quality templates that include all necessary details like purchase and sale, witnesses, terms, conditions etc. You can also download our free samples, examples and edit them to create your own stock purchase agreement. 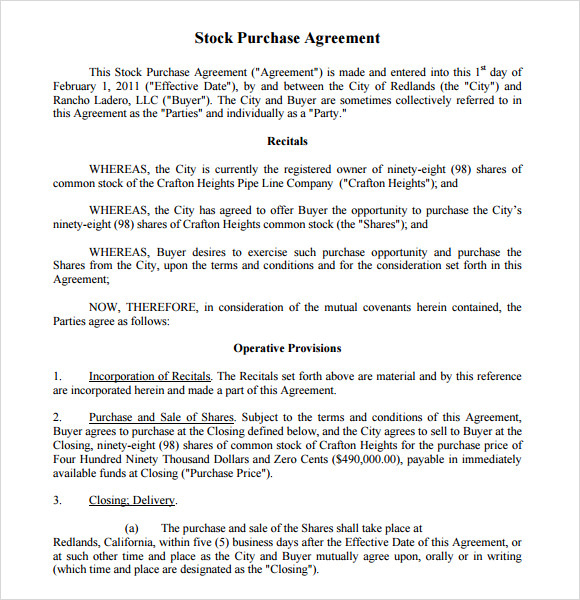 If you are a broker or an agent and you need to give your clients stock purchase agreement then you may need to use it often for this purpose. 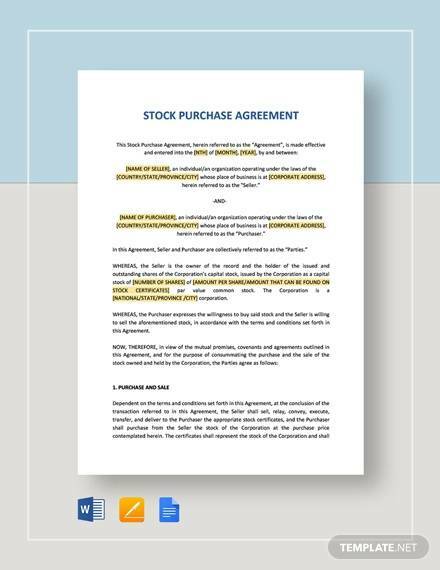 If you need a good format for making the agreements then you can use this sample template of the stock purchase agreement. 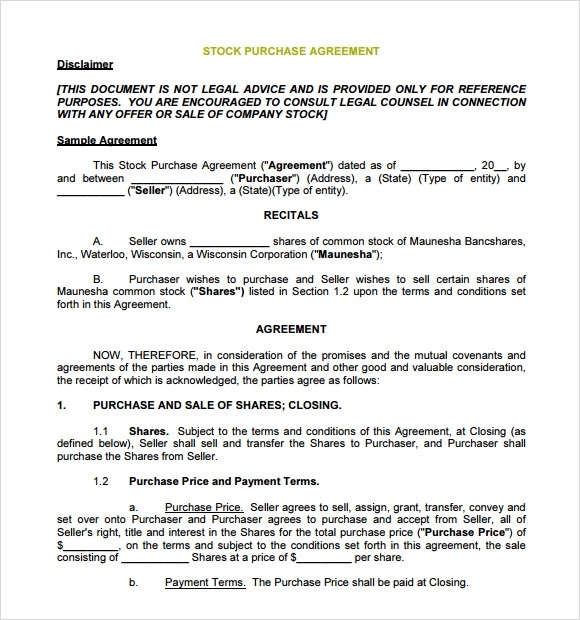 If you are looking for a good stock purchase agreement sample which has all the requisite details, then you can check this free template for the same. This template is properly designed and has all the required terms and conditions. If you need to give your clients a letter of stock purchase after every transaction, then you need a good sample format that can be customized as per the requirements. With this sample, you can do your job without any hindrances. 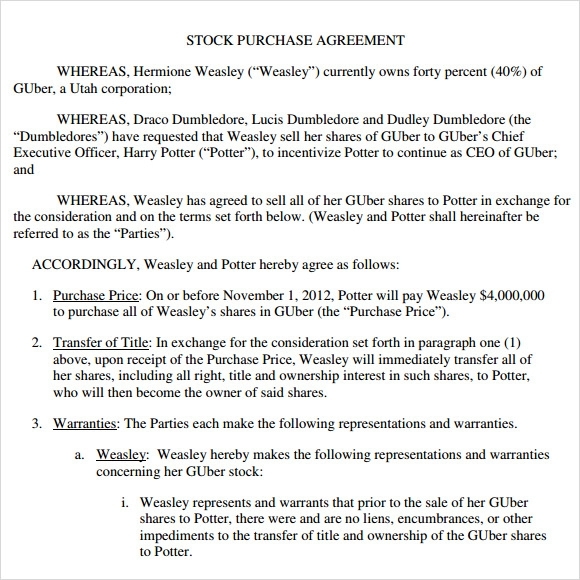 If you can get a stock purchase agreement sample then you can easily create this kind of agreement. Though you can get samples on the internet but with this template, you can do a lot more. You can download them and put your details too as per your requirements. If you have broking firm or working as a commission agent in the stock market then for your customers as a proof of transaction you need to deliver them an agreement of stock purchase. These documents work as a proof of your transaction and also various other details like how much brokerage you are charging and what are the terms of conditions of this sale. To create one you need to give the details of the seller and the buyer along with the witnesses’ signature and also legal terms and conditions too. But if you don’t go into all the hassle then with the help of free templates you can do it easily. You may like Commercial Purchase Agreements. 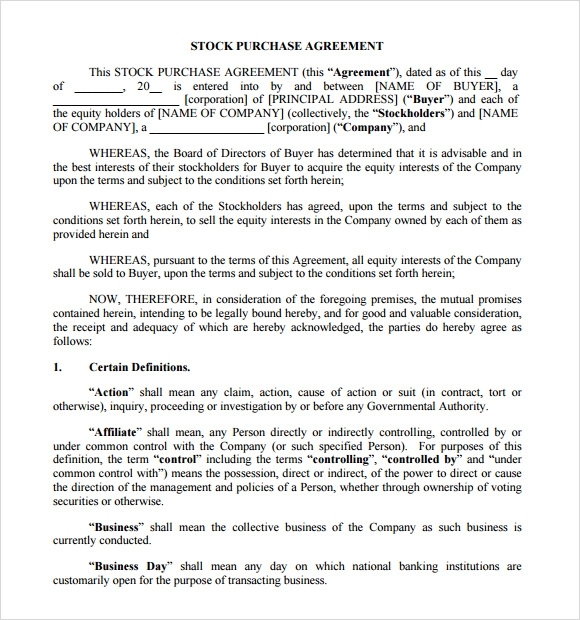 Why Do You Need Stock Purchase Agreement Templates? 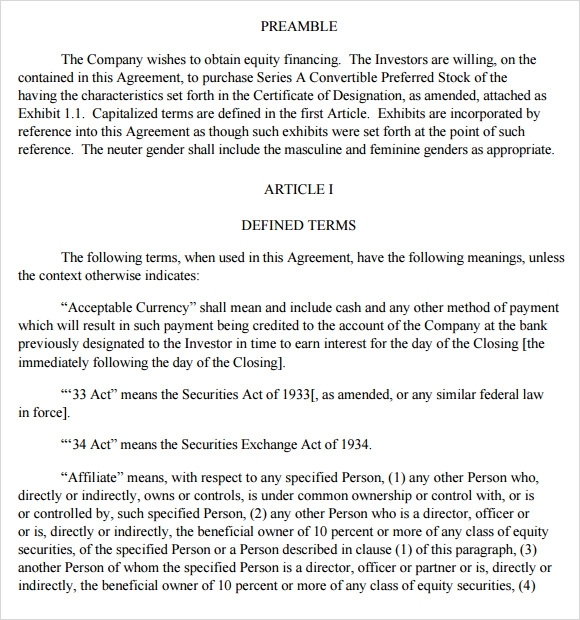 The stock purchase agreement is one of the pivotal documents that are needed for the purchase and sale of stocks in hand. This Purchase Agreements generally has greater emphasis when it comes to selling and buying the stocks from other persons or lending money in lieu of the same. Thus scrutinizing it is necessary. The agreement actually works as a proof and voucher of the transaction. So creating it in sync with the law is required, but most of the people aren’t aware of all the terms and conditions that should be mentioned in the agreement. This is why using the templates can eradicate the problems you may face while making the agreement by your won. What Are the Benefits of Stock Purchase Agreement Templates? All over the world, the importance of the stock purchase agreement is known and thus the use of this kind of agreement is very common amongst the brokers and investors. A stock purchase agreement must have all the details like details of the purchase of stocks, interpretation of the jargons, warranty details and many other things. Creating the agreement is really a hectic job but with the help of the templates, you can do it easily. Simultaneously you can save your time and get an ideal agreement copy for your use. If you need to use this document every off and on then it’s better to download a sample template of the agreement and use it whenever you need.